How does it feel when you finally become debt free? Today we are going to share a few tips that our clients have actually followed to get out of debt. 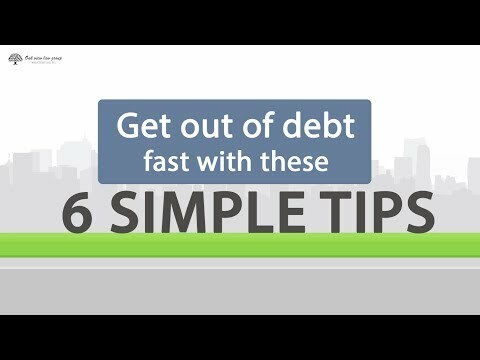 If you’re in debt, then you too can follow these tips to be debt free quickly. The first tip is, quit going to malls because you tend to spend a lot of money if you frequently go for shopping. The second one is, enroll in the OVLG debt settlement program. OVLG is an awesome law firm especially if you’re looking for reducing your unsecured debts like medical bills, personal loans, payday loans, credit card debts, etc. It’s the best organization to help you out. The next one is, buy used goods whenever you can. You can get used furniture at only $10. All you need to do is clean it up a little bit. The fourth tip is, sell anything you have that doesn’t have any sentimental value or you don’t need it. You may feel bad initially. But once you get out of debt, you can buy the things all over again. The fifth tip is, don’t buy anything for special occasions. Don’t buy a dress. Rather borrow it from your friend or be creative. And finally, use cash for absolutely everything. When you have changeable cash in your hand, you’re less likely to buy a lot of things. These are not all. There are many other get out of debt tips that give miraculous results in different scenarios. Call 800-530-OVLG to know about them. Here are a few debt relief programs you can use to clear your outstanding bills. Credit card settlement program to reduce your outstanding debt. Bankruptcy to pay off your credit cards in 3-4 months. Debt avalanche method to pay from the highest-interest debt to lowest-interest debt. Many people assume that medical bills are non-negotiable. But this is so not true. You have the right to negotiate with the medical provider. Here are a few tips to get started. Have you ever wondered how to get yourself out of debt when 90% of your loans comprise of personal loans, store cards, utility bills, and mortgage? The first three are unsecured debts and the last one is the secured debt. What will you do? Don’t panic. Take the following steps right now. Let’s find out how you can clear your dues in 4 situations. Check your credit report: Pull your credit report from the 3 bureaus and find out all the negative items on it. Check your credit card statements and others bills immediately. Are they correct? If they are correct, then the credit bureaus won’t agree to remove them from your report. The only option to get rid of them is to pay off your accounts. Don’t expect that the negative items will be removed immediately after paying off everything. If you have been a responsible consumer in the past, you can request your creditors to remove negative items out of your sheer goodwill. In that case, you have to send a goodwill letter to your creditor. If the creditor doesn’t accept your goodwill letter, then request him to change the status of your account to ‘paid as agreed’ or ‘paid in full’. Dispute the errors: See if there are errors on your credit report and dispute them. Look at every section of the credit report. If there is wrong information on your credit report, then send this letter to the credit bureau to get it removed. Make a budget plan: Create a budget plan to save a set amount every month. Free up as much money as possible to reduce your outstanding balance. List your fixed and variable expenses. Fixed expenses include rent, mortgage, food, insurance premiums, etc. Variable expenses include gym memberships, Netflix subscription, shopping, etc. Cut down your variable expenses and use the saved money to make additional payments to your creditors. Take out a consolidation loan: Unlike credit card issuers, lenders and credit unions are more flexible when it comes to lending money. You can take out a loan at a reasonable interest rate and pay back your creditors. Some lenders may agree to issue a loan if you can bring a co-signer on board, someone who has a good credit score and is willing to apply for the loan with you. If you fail to repay the loan, the co-signer must pay it off. Some lenders may give you the option to pledge your vehicle as a security. But in that case, you’ll lose the vehicle in the event of loan default. The fastest way to repay your credit card bills is to take out a debt consolidation loan. You can replace your credit card bills with a big loan and pay it off gradually. But this is not a good solution since you’re just replacing your old debt with a new one. Besides, if the loan term is long or the interest is huge (which can be if you have bad credit), you’ll pay more eventually. So what are the other options? Let's find out. Debt consolidation program: Here a debt counselor tells you how to lower interests and save money on your credit cards. There is no need to pledge collateral like you have to do against a secured consolidation loan. Debt settlement program: Here the debt attorney/negotiator explains the process of how to get out of credit debt and negotiates with your creditors for giving you the best deal. Budgeting: If you ask a credit counselor how to get me out of debt, then the first line he is going to throw at you is that ‘start budgeting as soon as possible’. You need extra money to achieve financial freedom. One way to get extra money is budgeting and the other way is to do a part-time job. I will talk about it in the next section. Debt snowball method: This is the best way to pay your credit card bills fast when you want to get rid of small balances first. Here you target the credit card with the smallest balance and make extra payments on it till it is paid off. Once you achieve your goal, you can make additional payments on the card with the second smallest balance. When you have a low income, you should try to increase it and pay off debt. Here are a few steps you should take. 1 Get serious about budgeting: Tell your kids that you’re on a budget to pay off debt obligations. You need their cooperation on what matters: day-to-day spending, paying your bills, and building wealth. Budgeting is not scary. By following some techniques, you can easily manage your debt and other bills payments. Since the income is low, you can follow the zero-sum budgeting technique. It works great to maximize your income. In this method, you have to allocate all of your dollars to the necessities like monthly bills, debt payment, emergency fund, and savings. Every dollar has a purpose; you shouldn’t waste a single dollar. Zero-sum budget is best for paying off debts because after allocating money to each purpose, you have to allocate the extra money toward the debt payments. You can’t use the extra money for other purposes. 2 Cut down the biggest expenses: When paying off the debt is your concern, then you have to cut down on the costly expenses aggressively. Look at your budget to find out the expenses that are costly but can be eliminated. It will help you save more to make debt payments smoothly. 3 Avoid costly hobbies: Think carefully. Do you need to splurge $300 on designer accessories? Are you serious? Do you often visit the gym? If no, then why are you paying for the membership? Walk to your workplace instead of driving your car. Walking is a good cardio exercise for which you don’t have to pay a penny. 4 Use cash: When you are following a budget to get rid of your debts, you should stay within your limit; using cash can help you to do that. Carry cash when you are going out shopping. As soon as you realize you are running out of cash for the day, you have to stop shopping. 5 Start couponing: You can save a ton of money by couponing. Just make sure you’re showing the right coupon for the product you usually buy. Otherwise, you could end up buying a product you’ll never use. 6 Cut cable: You can watch most shows online. Use that $100 cable bill toward your debts and see how quickly you become debt free. If you are paying for the Internet, then try to maximize its benefit. 7 Do a part-time job: A part-time job in your spare time can help to put extra cash in your wallet. This is a small sacrifice you need to do for eradicating debt. Earning $50-$100 can help you to pay off your debt faster! You can even earn more than that by considering freelance jobs that are available online. Search on the Internet to find out a job that suits you best and help you boost your income. 8 Reduce your credit card usage: When you have debts and the income is low, then you shouldn’t consider your credit cards as the savior. You should use only cash for purchasing necessary items. 9 Stop visiting Starbucks: Avoiding Starbucks on your way to the office can save $5-$7 dollars a day and $25 or more a week. Make your own Starbucks coffee at home. Search online to know how to make Starbucks coffee at home. It tastes as good as Starbucks coffee. 10 Stop eating out: The food cost can add up more if you lunch out every day. You can save up to $50 every month that could go toward the debt payments. Cook on your own and brown bag your lunch to cut down expenses. 11 Sell things you don’t use: Keeping things you don’t use doesn’t make sense, especially when you need some extra money. Bring in extra money by selling the items that you haven’t used. Sell even a car that you rarely drive. Keeping multiple cars is not a wise thing when you need extra money. Keep just one car and sell other cars to save on gas and maintenance. 12 Be smart while shopping: To avoid overspending while shopping, carry a shopping list and stick to it. If you want to shop for clothes, take a look at your closet to avoid buying repetitive items. You need to check your refrigerator or kitchen before going grocery shopping. Also, avoid buying in bulk just to get the discounted price. Buy the items that you truly need. Try to make a grocery shopping list including the amount that you need for the month before heading to the grocery store. 1. Debt settlement: The quickest way to get out of credit card debt and payday loan is debt settlement. The Financial Coach asks about your total payoff amount and your affordability. Once he gets the figure, he begins the negotiation process. This program works best when your financial goal is to save money on the total outstanding balance. 3. Debt management: One of the simple ways to remove debt is a debt management program. The debt counselor tells you how to budget, which is very important since it helps you generate free cash for paying back your creditors. The counselor negotiates to lower the interest rate on your credit cards, personal loans, store cards, payday loans, etc. When you pay low-interest on your credit card bills, it becomes easier to get out of a lot of debt. Obviously, this isn’t one of the smart ways to get out of debt since your credit score falls by more than 200 points. 5. Interest rate arbitration: It’s a process wherein you repay your existing loans with a secured loan at a low-interest rate.. This helps to cut down the overall interest rate on your loan. Hence, it’s called interest rate arbitration. Some people also call it loan consolidation. If you don’t have funds to pay high-interest rates on unsecured debts, then one of the best get out of debt programs is interest rate arbitration. You can save a significant amount every month and shorten the repayment period too. The best part of this option is that you can allocate the extra money to other areas of your budget. Lower interest is not the only advantage. There are other advantages as well. For instance, you have to make only one monthly payment, and this reduces the likelihood of missing a due date. It depends on your financial situation. Consolidation program is the best way to get out of debt fast when you want to save on the interest and combine multiple bills into a single monthly payment plan. The settlement is the best option when you want to reduce the overall balance. Bankruptcy is a good option when you are ready to sell off non-exempt assets or follow a repayment plan for 5 years. Always use a calculator to get the correct figures since they help you to make an informed decision. More than 6000 clients have successfully paid off their debts and are now leading a stress-free life. Here’s what they have to say after becoming debt-free. Here are a few frugal living tips our clients used to pay back their creditors. 1. Plan your grocery shopping:Make a grocery shopping list as per your budget. If you have allocated $30 for grocery shopping, then you shouldn't spend more than this amount. Use a calculator so that you can calculate the price of all the items in your cart. You can buy groceries online to get all the items on your list at a huge discount. If you need help with meal planning, check out the websites that give meal plans with delicious recipes. This will help you save on grocery shopping. 2. Sell unused items on Craigslist:Your trash can be someone’s treasure. Explore your closet and kids’ rooms to find items you can sell to make quick cash. Sell the jewelry that you hardly wear. You can always buy them back when your financial house is slightly stable. 3. Visit the library:Go to the state library and borrow books you want to read. Don’t waste money on new books. Watch out for those days when you can get a bag of books at only $1. 4. Terminate unused subscriptions:There are tons of tools that can help you analyze all your subscriptions and find out the ones that you don’t use much. You can cancel the paid unused subscriptions and save money. 5. Stop buying junk foods:Junk foods are not good for your health and wallet. Don’t buy chips, burgers, hot dogs, and other types of processed foods. They eat up a huge portion of your grocery budget. Switch to frugal and healthy snacks. 6. Switch to a low-cost cell phone plan:Get a plan that is low and economical. Find a plan that suits your requirements and helps you save money on your cell phone plan. 7. Get a roommate or downsize:Sell your expensive house and move to a smaller house. This can help you save on your mortgage. You can get a roommate to lower your housing cost. 8. Use energy in the off-peak hours:Several energy companies offer huge discounts if you use energy during the off-peak hours. Contact the electric company and find out if there is an off-peak plan that suits your lifestyle. 9. Take the brown bag to work:Start cooking at home if you want to eat good food without spending a fortune. Find easy recipes with minimum ingredients online. Carry lunch to work every day to save on your daily expenses. 10. Use prepaid cards:Use these cards for online shopping. The best part of these cards is that you can’t cross your budget. There is no place for impulsive purchases. Once your funds run out, you can’t buy anything else. 11. Use the envelope system:Cash gives you a picture of the harsh reality. It reminds that you have worked very hard to earn the money. This induces you to reduce your expenses. 12. Sell your car and use the money to pay your bills:The average car maintenance costs $400 per month. Just think how quickly you can get rid of debt if you pay an extra $400 every month. 13. Get rid of your past spending behavior:Eliminate the reasons you went into debt. Stop buying things you can’t afford. Figure out what kind of life you can afford. Create an emergency fund if you have never made one in the past. 14. Stop borrowing money and get extra cash:Live within your means. Spend less than you earn. Ask for a raise to get extra cash and use it to repay your bills. Work harder since extra hours can help you earn extra dollars. Debt elimination involves more than just paying off a few plastic cards and loans. It means changing financial habits, learning to manage the household budget, knowing how much you owe, creating a fat emergency fund, and discovering the best place to get back on the right track. In other words, there are several decisions you have to make, and it’s possible to make a few mistakes when you’re trying to repay your outstanding bills. Here are a few mistakes you should avoid to repay your bills easily. Are you making extra payments only on personal loan? Have you increased your payments on other loans as well? If not, then you can’t erase your debt fully. It’s a big no-no. If you keep on charging credit cards while you’re in a debt relief program, then you can never progress financially. You should stop using plastic cards so that you don’t undo any progress you have made so far. You need to save money for eliminating your debts. A luxurious lifestyle can never help you to increase your savings. If you make frequent trips, dine out regularly, and buy whatever you like, it would stop you from putting extra money toward your debts. How do you want to pay back your creditors and when? Do you have any answer? You need a detailed plan and a clear strategy to pay everything off. Otherwise, it’s impossible to focus and figure out how you would make the next payment. You’re determined to clear your debts. However, your family doesn’t have the same passion for paying everything off. They are not willing to work hard and support you to complete your mission. This can be troublesome since you need to be on the same page with your partner. Are you afraid of budgeting? Do you feel that a budget plan shows how bad you’re at money management and you avoid it? This is a grave mistake you’re making while paying bills. Why do you want to be debt free? Unless you have a solid reason, you won’t get that zeal to knock-off debt. Check out the benefits of a debt-free life. When you’re independent and have financial freedom, you can save for the future, buy gifts for others, and enjoy life fully. This may help you to pay back your creditors quickly. How soon can OVLG help me get out of debt? It depends on the type of the debt relief program you have chosen. If you have opted for a settlement program, it will take almost 2 years to pay back your creditors. In case of a debt management program or a consolidation plan, it will take between 2 and 5 years to knock-off debt. Much depends on the amount you owe, the interest you’re paying, and your affordability. OVLG can help you get out of debt fast if you can make additional payments every month. Always monitor your Client Secure Area to know how much extra you have to pay to attain financial freedom. How can I pay off debt without hurting my credit? 1. You can consolidate your debts onto a balance transfer card with a low APR. In fact, you can even get a card with 0% APR that usually lasts 12-18 months. Generally, you can qualify for this card with a credit score of 700. Make sure you pay the entire balance within 18 months. Otherwise, you have to pay an almost double interest rate to pay off your existing balance. 2. You can use the debt avalanche method to get back on the right financial track. This method is good when you can make extra payments on the highest interest debt every month while making the minimum payments on other cards. Once you kick out the highest interest card, you can shift your focus to the next card with the second highest interest rate. This method is exhausting as you have to save a huge amount every month. But the positive side of this method is that you can be debt free quickly. Make extra payments to lower your overall debt amount quickly. If you have to make large purchases, then save money for making the down payment. You’ll depend less on credit cards and it will help to lower debt-to-income ratio. How can I get out of debt in a year? When your aim is to eliminate debt in 12 months or less, there are a few smart strategies you can use. Here are a few of them. Put 15% of your paycheck towards your debt repayment. Making only small and minimum payments won’t help. Ask for a low-interest rate on your credit cards if you have been a good customer for several years. This can help you save a significant amount on the interest payment. There is no logic behind shouting ‘get me out of debt’ in forums if you use your tax refund for vacations and shopping. As soon as you receive your tax refund, use it to pay down your debts. Transfer high-rate debt to a zero percent interest credit card to knock out your multiple credit card bills. Make sure you pay off the teaser rate within the introductory period. Check the statute of limitations (SOL) period on your old credit cards when you want to get out of debt with no money. You can consider foregoing repayment of credit cards that are 7 to 10 years old. The SOL period refers to the period after which debt collectors can’t sue you for not paying your bills. If the SOL period in your state is over, then you can avoid paying off your credit card. Where can I get financial advice to get out of debt? OVLG: Call 800-530-OVLG to contact OVLG Financial Coach and get advice on how to pay your credit card bills quickly. Give all the details so that he/she can help you in the best way. Credit counseling agencies: Contact credit counselors who can suggest you the steps to get out of debt. Check the accreditation and fee structure of the credit counseling agency before approaching them. Debt and bankruptcy attorneys: No one understands the psychology of creditors and state laws better than debt and bankruptcy attorneys. You can get the best tips to get out of debt fast from them. Friends: Do you have a friend who is very good at managing finances? Ask him the quickest way to get out of debt. Perhaps he can give you some good suggestions.